NetControl.net Archive of :: WARBIRDS: The real aircrafts! You are visitor number to this page since 14. March 1996. -My personal definition of the term "warbirds" is military aircrafts built between 1935 and 1955. Click here to listen to a P-51 flyby (merlin.wav 141Kb). Click here to read about the Rolls-Royce Merlin engine. 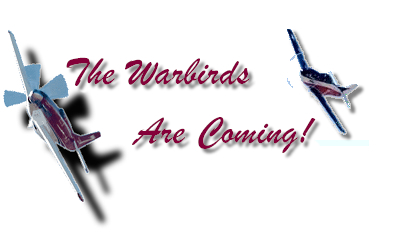 Please give your comments to my warbird pages! Where did you find the link to this page? [P-51 Mustang], [A-26 Invader], [Spitfire], [RR Merlin], [Airshow pictures], [Sound], [Vampire], [Warbirds in Norway], [Links]. Last updated: 17. July 1996. Back to personal home page.